Here is a photo from http://militaryhistoryofthe20thcentury.blogspot.com/that needs an answer. 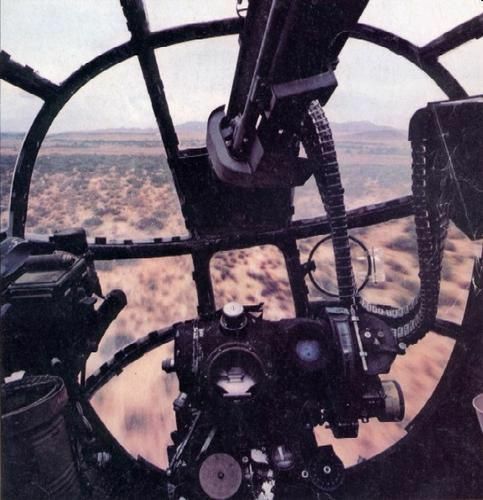 The blogger wants to know which type of plane this is just from a photo taken from the nose gunner's position. I think some one would have to be an airplane expert. I have no idea. Good luck trying to figure this one out. Last edited by burntmoon; 23 Sep 11, 23:42. Definitely a Nordon Bombsight there. Thanks to both of you. I feel kind of foolish for never checking that site to ID the photo. I must have had a brain cramp. Sorry excuse but it is the truth. B-17, based on the Norden bombsight. Bombarider's view out front of a B-25 on low-level mission of Basic Multi-Engine School at Vance AFB, Enid OK in the summer of 1953. EDIT: crap, didn't notice the above posts - clicked this thread hours ago.